Richard Irwin (Belper, United Kingdom) on 14 April 2008 in Plant & Nature. The Daffs have been out for ages now, but still they are flowering. I thought I should get this image posted before they disappear for another year. I love the way the light hist the flowers. nice colour and idea too! Beautiful! The photo is so heart warming. Like this; close-up and low. Very cleverly framed. I especially like the one intruding into the left corner. Great colours and perspective.Being a Welshman the Daffy´s just leapt out to me. Nice light, beautiful colors! Our daffodils just started blooming last week. @Betty: Thats great to hear. Ours should have finished weeks back, but a late cold spell has given them a new lease of life, so their still with us. A beautiful spring image Richard, the lighting is wonderful. 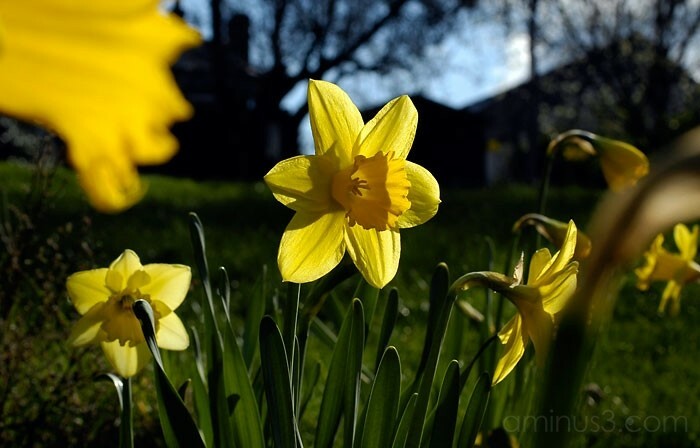 @MaryB: Its funny this year, the daffs are hanging around flowering for ages, I think the recent cold spell has let them stay on for a bit longer. Great composition - the perfect balance of foreground and background and great colors. Beautiful lighting and colors! Great shot! LOVE the pov and that light!! Wonderful, Richard!! Nice focus and energetic colours!